Tan Sri Quek Leng chan is the co-founder of the Hong Leong Group Malaysia, one of the largest banks in the country. He is currently the sixth richest man with wealth of RM8billion. As a tycoon, Tan Sri Quek is known to be quite a gambler, where he is not afraid to take risks but have in many instances come out victorious. The Hong Leong Group is the owner and operator of Hong Leong Bank and it is much attributed to Tan Sri Quek’s foresight and hardwork. He is actually a lawyer in practice who today is the Chairman and CEO of the group. His cousin Kwek Leng Beng is the man who runs the Singapore Hong Leong operations. Today, Hong Leong is involved not only in the banking business but also in other sectors like real estate and manufacturing. 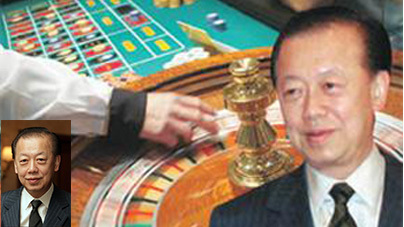 In fact, Tan Sri Quek is known not only to take gambles in his businesses but also on the casino table. So much has he the interest in gambling that he did actually buy over some gambling licenses overseas. The high roller tycoon is not as over celebrated like other tycoons like the late Tan Sri Lim Goh Tong but he is cigar lover who has frequents casinos in Las Vegas and Macau. Close friends to him claim that Tan Sri Quek is actually a skilled mahjong player. Through his stakes in Guoco Group, he had in 2008 ventured into the gaming business through Galaxy Mega Resort on the Cotai Strip in Macau. This would only extend his empire further after hiaving taken over the controlling interest in the Rank group a few years ago. Rank is the holder of 47 out of 187 casino licenses in the UK. On top of that, Guoco Group also had in 2011 bought a 7.3% share in AMR Corp which owns American Airlines.